Feldman was the goggle-eyed clown whose innovative slap-stick helped usher in the anarchic age of Monty Python and sent him to Hollywood stardom alongside Mel Brooks and Gene Wilder. Penned by the likes of Palin, Cleese, Chapman and Feldman himself, his BBC shows of the late 60s were full of the famous and often controversial sketches (including The Loneliness of the Long-distance Golfer and the Bavarian wine treading dance) that put Feldman’s zany, surreal style on the map. This selection of Feldman sketches from his BBC series showcases a unique comic style that recalls the era of silent slapstick comedy, but encapsulates the surreal spirit of 1960s new comedy. 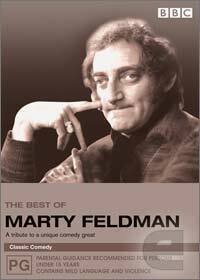 The spooky looking Feldman that was loved by millions for his extraordinary BBC comedy series gives connoisseurs of "ancient comedy" a true look into the history of how comedy began and grew from the UK. This series amazingly enough has quite a few laughs for such as dated series and would be the ideal gift to anyone from the era. Great stuff!